He’s the guy who fought Mola Ram on a precarious suspension bridge. He leapt from a galloping steed onto a raging German tank. He traded punches with Zod, Non, and Ursa in the streets of Metropolis, taking a manhole-Frisbee to the ribs. 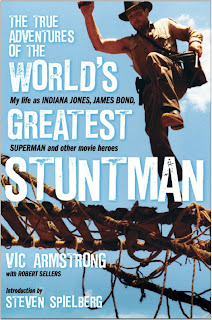 Stuntman extraordinaire Vic Armstrong choreographed action sequences for every actor who ever played 007. If anyone could write the book on stunt work in Hollywood blockbusters, it’d be the guy who donned Indiana Jones’ iconic fedora and Superman’s cape. Turns out he already has. Now available from Titan Books, The True Life of the World’s Greatest Stuntman is Armstrong’s movie memoir, a hefty tome chronicling his fifty years arranging and performing some of the most physically demanding—and visually appealing—feats ever committed to celluloid. It’s an intriguing look behind the lens, spanning Armstrong’s humble days as the son of a Farnham Commons horse farrier to his recent work as assistant director on multimillion dollar action pics THOR and THE AMAZING-SPIDER MAN. The autobiography quite literally opens with the author in a heap of shite, as Armstrong recalls practicing a jump for INDIANA JONES by throwing himself into manure. It’s the kind of “mind over matter” philosophy that steeled the stuntman throughout his career, inspiring him to do whatever was necessary to bring stories to life realistically—but without undue risk to himself and others. Raised near Pinewood Studios in Buckinghamshire, the lad served as apprentice to his father—who shoed horses for the British Olympic team and trained boxers using blacksmithing equipment. Mounting his first racehorse at age nine, Armstrong nurtured a lifelong love of all things equine and fortuitously scored a job doubling for Gregory Peck in ARABESQUE. It’s a rule Armstrong would break repeatedly (along with his collarbone, arm, shin, and ribs) over the decades while training horses—and celebrity riders like Robert De Niro, Michael York, Timothy Dalton, and Heath Ledger. But his love of horses inspired him to revolutionize the industry with humane techniques for felling them in gladiator movies and westerns, eliminating the need for cruel “toe-taps” that formerly yanked the animals to the ground. Armstrong shares memories of his first bona fide stunt job on Bond movie YOU ONLY LIVE TWICE, playing one of many ninjas repelling into Blofeld’s volcano lair. He was one of George Lazenby’s doubles for ON HER MAJESTY’S SECRET SERVICE, when the Australian actor inherited the role from Sean Connery. Armstrong was directing the pre-credits adventure sequences for franchise producer Albert R. Broccoli by the time Pierce Brosnon became Bond in the’90s, adding to his impressive resume the jet fighter gambit at Kypher Pass (TOMORROW NEVER DIES), Bond’s jet-boat race along the Thames (THE WORLD IS NOT ENOUGH), and an over-the-top hovercraft escape (DIE ANOTHER DAY). And even when not performing the stunts himself, Armstrong designed and orchestrated memorable scenes, including Bond’s rooftop motorcycle jump over a helicopter, a getaway in a BMW driven by remote while ducking in its back seat, and a drag race between a Jaguar and Aston-Martin on a frozen lake in Reykjavik. So uncanny was Armstrong’s likeness to Harrison Ford in the early ‘80s that even Steven Spielberg mistook him for his leading man. So did Harrison’s own son. “We’ve got to use him for Harrison,” the RAIDERS OF THE LOST ARK director insisted. 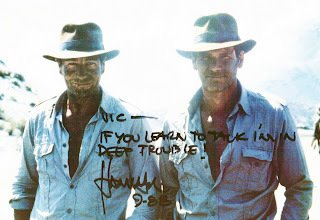 Writing about Indy’s first adventure, Armstrong says it was (assistant director) Dave Tomblin’s idea to have their hero simply shoot the Cairo swordsman (played by Terry Richards); Spielberg was pressed for time and wanted to avoid filming a protracted fight sequence storyboarded for the two characters. It was Armstrong’s idea to revisit the gag in TEMPLE OF DOOM, when Indy reaches for his pistol—only to find it isn’t there. The super-stuntman rescued production on TEMPLE by stepping into Indy’s shoes after Ford threw his back out riding elephants in India. That’s Armstrong duking it out with a gigantic Thugee on the stone-crushing conveyor and grappling with Mola Ram during the film’s climactic bridge collapse. His wife, Wendy Leech, doubled for Kate Capshaw in TEMPLE (the Obi-Wan Club escape) and Alison Doody in LAST CRUSADE (the Venetian boat battle). 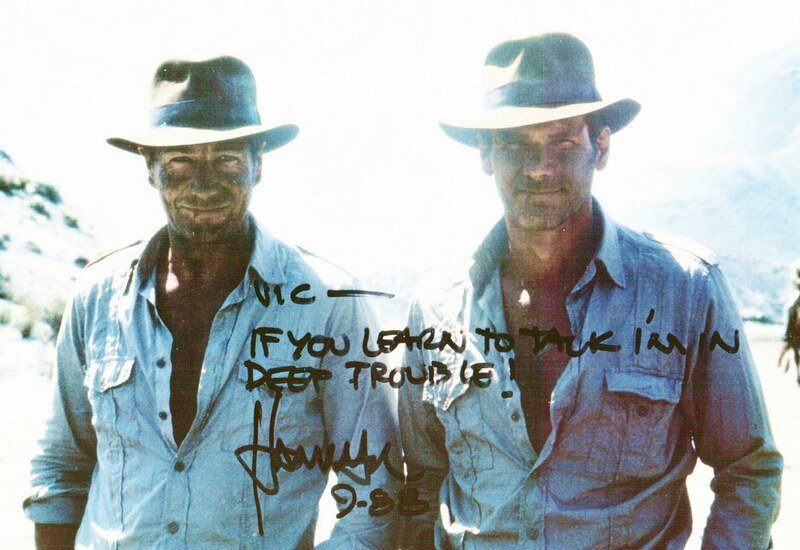 The stuntman describes Ford as one of the most professional—yet modest—stars he’s ever worked with, and was dumbfounded when an enthusiastic Harrison showed off the dovetail joints he’d crafted on a dresser drawer—woodwork no one would ever see. Armstrong also recounts how he was able to protect Ford, diplomatically talking the eager actor out of doing too many of his own stunts by appealing to his generosity: “If you keep doing all the stunts, Harrison, I’m not making any extra.” Realizing his faux pas, the apologetic actor threw a wild party for the entire cast—and made it look as if Vic paid the tab. Among Armstrong’s technical innovations: a variable-speed fan descender (to slow falls / jumps off buildings), a blue-screen treadmill for Clydesdales (in KRULL), a “vertical set” to simulate a depressurized Martian environment (TOTAL RECALL), and a massive chain explosion encompassing a half-mile valley in Wyoming (STARSHIP TROOPERS). Armstrong also dishes on some behind-the-scenes debauchery, reporting on Oliver Reed’s drunken shenanigans and table dancing with Mel Gibson and Robert Downey, Jr. on the AIR AMERICA set. The book focuses on Armstrong’s work, touching on family matters if only out of necessity—since Vic’s sons and nephews are now part of “Team Armstrong.” The author doesn’t fling any dirt but does confide that Phillip Seymour-Hoffman and Leonardi DiCaprio were a bit temperamental at first. Among Vic’s favorite action stars? Schwarzenegger, Stallone, Cruise, and Will Smith. Armstrong also reserves praise for the ladies, noting that Cameron Diaz is a “brilliant driver,” and that Scarlet Johansen, Carrie-Anne Moss, and Angelina Jolie were among his most courageous pupils. The closing chapter finds the SUPERMAN stuntman revisiting comic book territory, handling stunts and assistant director duties for blockbuster THOR and the upcoming AMAZING SPIDER-MAN. An appropriate denouement, given Armstrong’s penchant for turning ordinary characters and situations into extraordinary movie moments.